Miki is a baby meerkat who lives with his Mama in a zoo. He's happy at home with Mama and the kind keeper who cares for them, but soon he becomes curious about the wider world. The one day Miki ventures a bit too far out into the world, and he's not sure where he is anymore. Who do all these legs belong to? Soon the legs turn from animal legs to people legs - Miki really has gone too far! But just when Miki feels completely lost, there are the keepers familiar booted legs, and here's the keeper to bring him home; and from his vantage point in the keepers arms all the legs that seemed so intimidating on the way out are revealed to have friendly, happy faces with them! My kids loved this book! 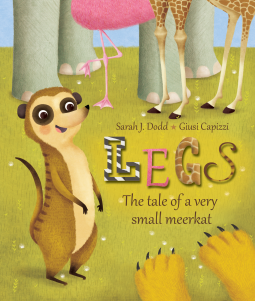 The book is about a baby meerkat named Miki who lives at the zoo with his Mama. He decides he wants to see more of the world so he ventures outside on his own, only to find lots of legs. He is then found by a pair of familiar legs who helps reunite him with his mama. The illustrations are very cute and my kids enjoyed the story very much. Such a cute children's book!